All facial treatments are personalised and customised to YOUR specific skin condition. Not just a treatment … AN EXPERIENCE ! 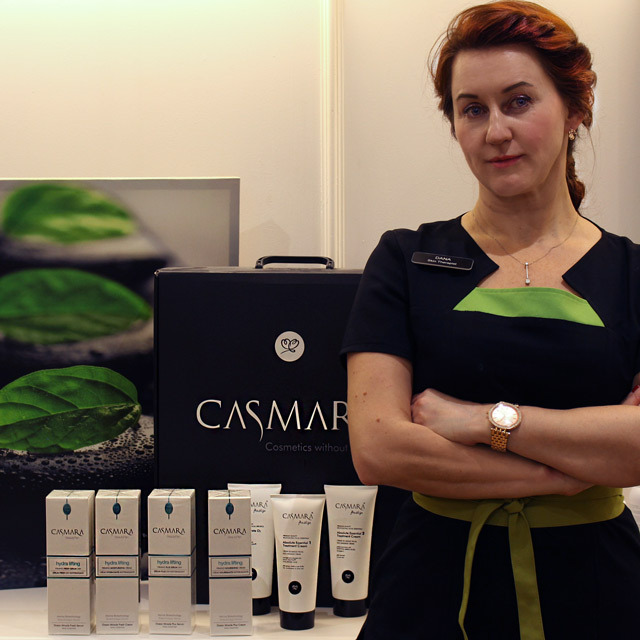 Facials are one of the most popular beauty treatments, with women and more increasingly men. Come for an experience of a perfect facial, used for relaxation and to help with any skin disorders. From the moment you enter the Beauty Salon you are guaranteed to experience a personalized session, that is second to none. 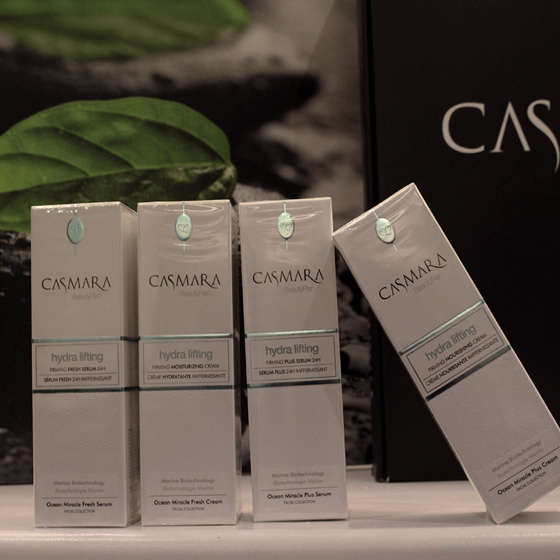 For beauty treatments I use salon quality skincare products that are acknowledged by years of practice to be the best in the beauty industry. 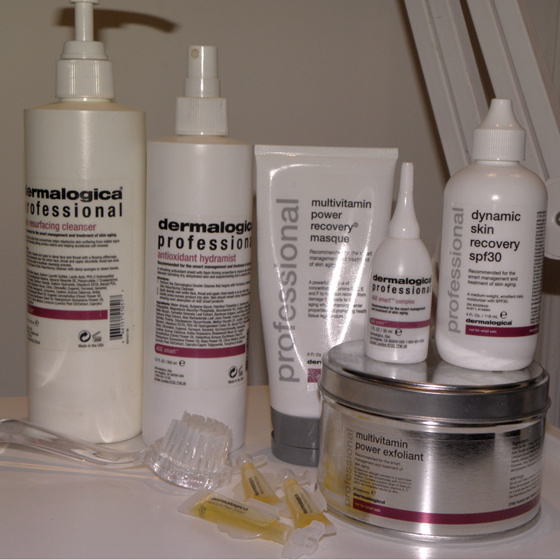 Dermalogica is considered by beauty therapists as one of professional and most effective application products. 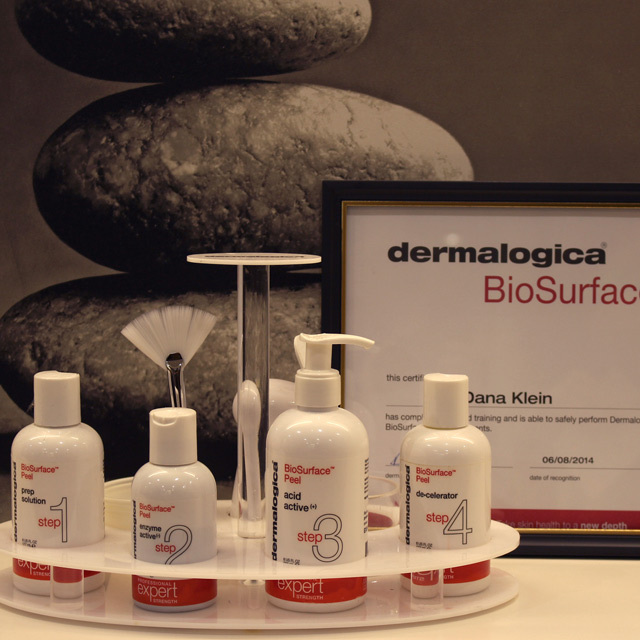 Dermalogica - is professional skin care system researched and developed by The International Dermal Institute. All products are entirely free from parabens, petrochemicals, SLS/SLES, synthetic aromas, synthetic colours and preservatives. They are BBDIH and NA true certified ocean. 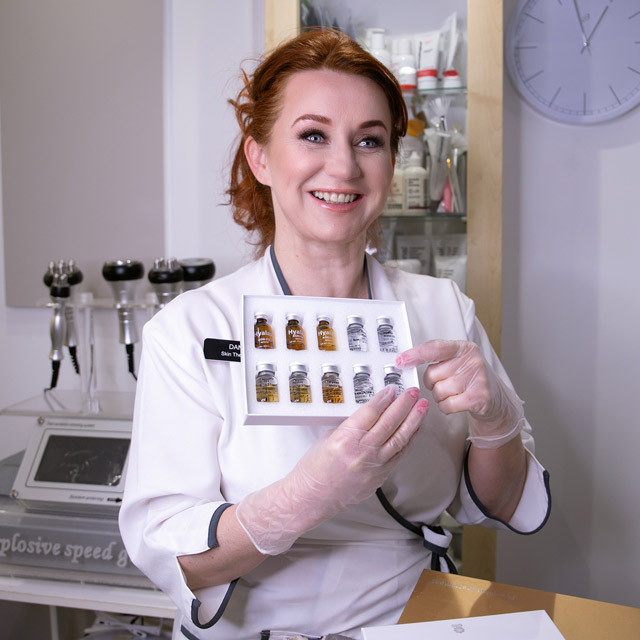 Being a beauty therapist with medical background, I have obtained an Accredited Certificate from Dermalogic Cosmetic Laboratories (DCL) in subjects "Peels and Product Knowledge" (2013), "Bio Surface Peel"(2014) and have successfully achieved Dermalogica Expert Status in 2014. Following new trends in cosmetic innovative technologies, I have completed required training to perform Dermalogica IonActive Power Treatments (2017). Unique Dermalogica analysis of your skin in order to detect signs of dehydration, breakouts, hyperpigmentation and congestion in 14 different zones of your face. Each zone, then, is examined so that to diagnose the skin condition and to prescribe treatments and home-care products for optimum results. Incl. : double cleanse, exfoliation, steam, manual extraction (if required), application of high frequency, soothing clay masque, tone & moisturize. Essential face therapy that goes far beyond just a facial. Every treatment is tailored individually according client skin type and condition. IProfessional and result-driven treatment that combines ultrasound technology and thermal gelloid massaging.. Each treatment is completely personalised according to your Face Mapping® skin analysis. 1% Retinol to firm and reduce visible signs of skin ageing. Indulge yourself into this relaxing treatment! Aromatherapy massage aids to release tension and toxins, while facial rejuvenates the skin and gives it healthy glow! Incl. : 30 min. massage, double cleanse, exfoliation with steam, extraction (if needed), massage, masque, tone & moisturize. 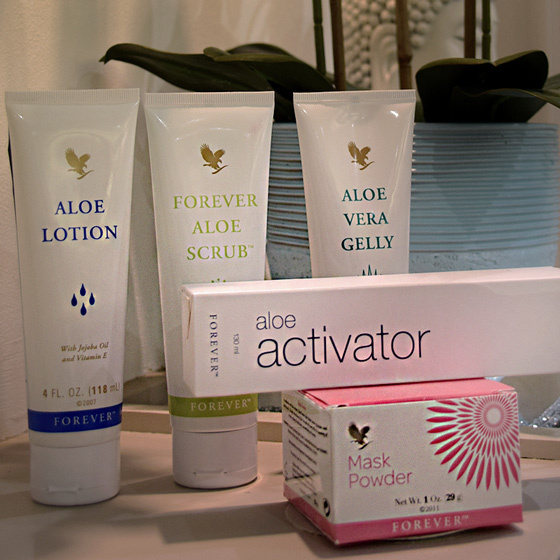 Add on to any chosen facial for extra benefit and long lasting result. Dermapen™ is a revolutionary micro-needling treatment, which aims to tighten, lift and rejuvenate the skin. It uses tiny micro-medical needles to create controlled trauma therefore to promote natural ability of the skin to heal itself. It is ideal for treating: fine lines, wrinkles, surgical, acne and trauma, scars, stretch marks, discolouration and pigmentation. How many numbers of treatments do you need? The number of treatments depends on how significant result you want to achieve, and the condition of your skin it is being performed on. 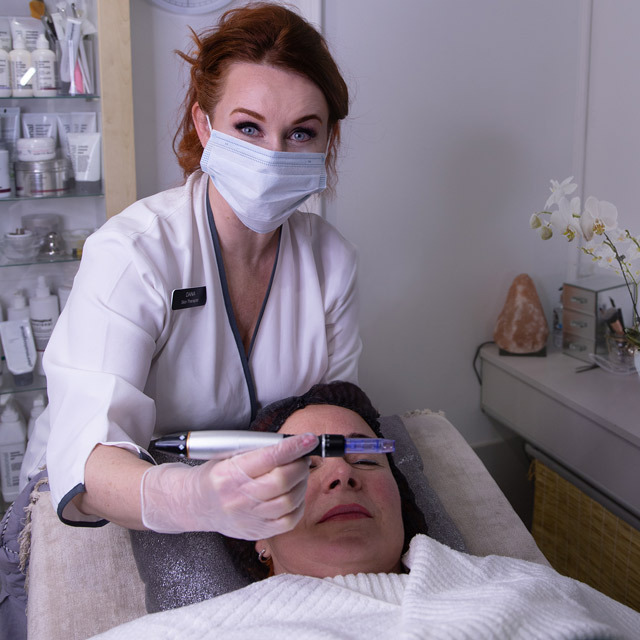 For wrinkles or stretch marks, depending on the severity, one may need 4 to 8 microneedling treatments, spaced 4 to 6 weeks apart to ensure the health and safety of your skin. The risk involved in microneedling treatments are minimal. After a treatment, dry skin or red discoloration may occur, which will typically subside within a week. Incl. : double cleanse, application of Dermapen, restoring masque, tone & moisturize. The unique Algae Peel-off Mask formulated with seaweed extract that provides a pow-erful hydrating effect, along with diverse active ingredients which are different in every mask. A high technology cosmetic which lower the temperature of the skin by 6˚C providing a drainage effect, reducing puffiness and dark circles under the eyes in addi-tion to firming and toning the skin. It is powerful skin resurfacing treatment. Helps reduce breakouts, pigmentation and sign of premature aging to reveal smoother, brighter and softer skin. Dramatic skin smoothing. No downtime. Course of 3-6 recommended. Incl. : double cleanse, application of Bio Surface Peel, restoring masque, tone & moisturize. It is powerful skin resurfacing treatment. Helps reduce breakouts, pigmentation and sign of premature aging to reveal smoother, brighter and softer skin. Dramatic skin smoothing. No downtime.Course of 3-6 recommended. I offer to my Clients 10% Discount for Leaving a Good Review on my Google and Yell Accounts! Non-invasive skin resurfacing procedure. This procedure removes skin debris, imperfections, blemishes, smooth fine lines and scars, minimise pores and pigmentation, lift the skin. The result is healthy, softer and smoother skin. Deep cleansing treatment. Ultrasound waves are transmitted at 30,000Hz per second through little metal spatula creating pleasant vibration. It gently lifts dead skin cells, excessive oil and other debris from clogged pores. This is deep exfoliating procedure which results in glowing, more youthful looking skin. Powerful non-invasive anti-aging treatment. Heating action increase blood flow to the skin cells which stimulated collagen production within the deep structure of the skin. Non-invasive, pain free skin tightening treatment using radio frequency energy. It is causing collagen contraction, realignment and new collagen production. Helps to tone sagging facial muscles, while smoothing the appearance of fine lines and wrinkles.Course of treatments recommended every two weeks.